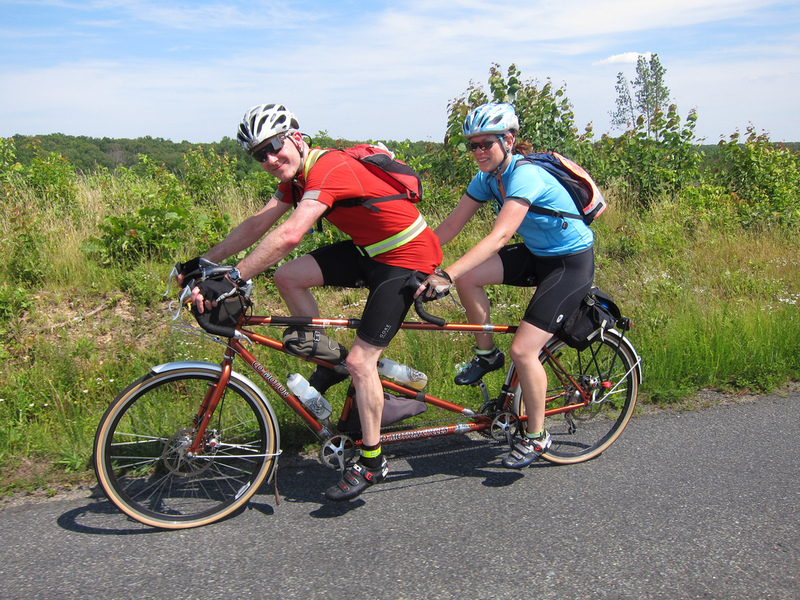 Tandem Cycling: Is She Really Not Pedaling? Those who have never ridden a tandem have a lot of thoughts about what riding a tandem must be like, and they will often share them with Felkerino and me when they see us out and about. I’m not quite sure why; there’s just something about riding that bike. People say some crazy stuff when I ride my single, but riding a tandem is somewhat akin to being pregnant. Certain people just can’t keep themselves from saying extra weird stuff. I believe most of these comments stem from a lack of understanding about riding tandem and not because they’re trying to get on my nerves. Therefore, the next time anyone says anything to me about it, I’m going to refer them to this post, which is designed to clarify some of the questions and misconceptions people have about tandem bicycling. The person who rides at the front of the bike is called the captain and the person in the back seat is the stoker. Usually, the taller person of the tandem team is the captain. If you are going to captain, you have to be conscientious and anticipatory about the terrain ahead. The stoker has no control over the gears, braking, or steering so he or she relies on the choices made by the captain. The stoker really has to trust the person captaining the bike, and the captain has to rely on a stoker who maintains a steady position and is responsive to the choices the captain makes. Often the captain (especially when a team is just starting out) will announce to the stoker what’s coming up. Bumps, stops, standing, and the like. As the team evolves, each person will get a sense of the other person’s riding style that will probably reduce or eliminate these verbal cues. In order to be a good tandem team, it’s important to be compatible. What do I mean in terms of compatibility? Spin/Cadence. If you like to grind a big gear, then riding with Felkerino would not be your thing, as he likes to maintain a higher cadence. I also prefer a higher spin on the tandem, though I prefer a slightly heavier gear when on my single. Stopping and Starting. Unlike riding a single bike, where you can take breaks whenever you feel like it, these must be coordinated among the team. If you are a person who likes to ride straight through a ride with minimal stops, then you probably would not like riding with Felkerino and me.We like to take breaks around every 50 miles when we ride brevets, and we stop for meals, too. Distance. It’s obvious, but you both have to agree upon the distance you’re going to travel. 20 miles, 50 miles, brevets. It’s best for both members of the team to commit to an agreed-upon distance. Otherwise, people get frustrated and nobody has a good ride. It’s important to have a shared understanding about how you plan to ride your ride on the same bike together. Otherwise, you might find yourself reaching for a coupler wrench or the nearest saw. Headwinds. Tandems are great for headwinds because you have both people, perfectly aligned, plowing into the wind. Two are better than one for taking on a headwind. Uphills. Tandems are a bummer on uphills. Felkerino and I weigh over three hundred pounds (together, not individually) and all of that weight works against us on an uphill. Downhills. Downhills are a tandem’s friend and, as Felkerino likes to say, they are our specialty. If you have a good runout or a descent that is not too twisty, you can really roll on a downhill. Felkerino and I have hit a sustained 56 miles per hour on select downhills in the Mid-Atlantic. Lo’ they were awesome. Rollers. Steep rollers are a drag, but there are some mild rollers (for example, the Berryville Century, which the Potomac Pedalers use for their annual century ride) that are tandem-friendly. That means you can take the momentum you both gathered up from the roller you just descended to reach the top of the next roller without grinding away. That type of terrain is quite fun. Ah ha ha ha ha ha ha! No. Let me tell you, when one person is not pedaling, the other person on the bike knows it. What happens is that the gear will become heavy and the captain will have to shift up to an easier gear. If the stoker is outpedaling the captain, the captain will be spun out. I think it’s called kicking the pedals or something. 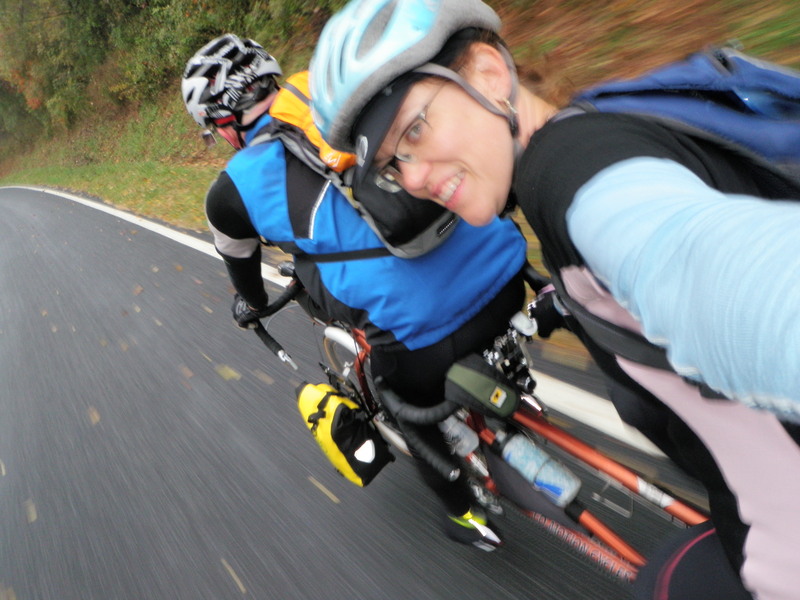 It is true for me that, when riding a tandem, I find it more difficult to always get a sense of how hard I am pedaling. The pedals keep turning round and round. I must be pedaling hard, right? Sometimes I might get distracted and my energy will go into thinking rather than pedaling. And guess what? I hear about it in a number of ways, which are stated in code and are usually a variation of “Are you ok back there, honey?” Not a very complex code, no? I believe night riding can be challenging for stokers. When it’s dark out in a rural area, there are no lights and I cannot see in front of me. Felkerino blocks my view. Peripherally, I have no view, either, as it is dark outside. My saving grace is a clear starry evening so I can occasionally look up and see which constellations are keeping us company. That darkness can be a real mental challenge. Nothing insurmountable, but an element the stoker must manage. The stoker always has a draft from the captain. In return, the captain takes the full brunt of the cold, wind, and any bugs that fly into the bike’s path. In wintertime or on cool fall days, the draft is great! I don’t have to layer up quite as much as Felkerino, my face does not get as beat up by the wind, and few bugs fly into me. In the summer, though, the draft can be a challenge because it is just that much hotter in the stoker zone on toasty summer days. My first year of riding tandem, I was unprepared for the heat as well as the additional draft protection and it caused some troubles for me. Now that I’m accustomed I have a better idea of what to expect. I suppose that it can be, but when you’ve ridden over 150 miles in one day, cute/sweet/romantic are not terms that come to mind. I think it’s bad@$$ (and a little sweaty and smelly). And when a long ride goes well on a tandem, it’s a pretty exhilarating feeling because it took both of you falling into sync and working together to make it happen. Hope you have found my “Tandem Cycling 411” helpful. Please let me know if you have any additional thoughts or questions. I’d also love to hear what other tandem teams would add. Oh, and welcome to the work week, everybody! So you’re saying Felkerino can tell when you unclip and prop your feet up on the top tube? former stoker here… (captain and Clifford moved away to get work) Great writeup! Best to get clear on which foot you put down when you stop – our test ride, we came up to the stop and (fortunately) we both put our left feet down. Stoker dismounts first and mounts last. Avoids getting kicked in the face. The stoker has front pockets and back pockets. The captain has no pockets. Standing takes practice, but it is a great skill to learn. There was some discussion about how much effort I was putting in. Fortunately, we used to compare our calories expended when we were riding singles. The ratio did not change on the tandem. So there. Great points, Lynne. You’re so right about the standing thing, too. I don’t know where I’d be if we couldn’t get out of the saddle on climbs. I am the captain, found it much harder than a normal bike. I have 21 speeds still found myself exhusted after a few short miles. Yes, I am always looking behind me to see if see she is peddling. It is a good work out though, just thought it would be easier. Fascinating things I’d never have known. You two are the coolest people! Great post, MG. I’ve only ridden on a tandem once for just a very brief ride and, as the stoker, I hated it. You really have to be in sync and we weren’t. I’ve broken 50 miles per hour once and it was terrifying. Sustained 56 miles per hours would put me in a cardiac care unit. I also enjoyed the post. You answered a bunch of questions I had and some I didn’t think of. Great article MG. History is rich with information on tandems and tandem riding. I keep hoping to see some non-traditional teams on the road. I remember Lon Haldeman and Bob Breedlove finishing RAAM in the early nighties with a slightly more than 8 day crossing. (could you and Felkerino do eight days?). I’ve never seen a double female team. I’ve only met one male/female team where the woman was the captain. That was on a Hase frame though. Great link. I love the criticism of their positioning on those photos. Too aero! Bad handlebar adjustment! I think RootChop just called me old. I have a ton of questions. The biggest one: Can I try? Do you guys ever bring it to Friday Coffee Hour? and share? :D.
Regarding night riding, have you thought of a powerful light on your helmet? That way you could enhance Felkerino’s view, as well as enjoying wherever your vision points. We don’t ride the tandem much in the city. It’s such a beast to stop and start and there is so much stopping and starting in the city. W/ regard to the light, I don’t think a high-powered light would work as it would just create a weird shadow and it would not allow Felkerino to see through his helmet mirror. I do use a small light to see the cue sheet and that helps a little and I suppose I could use a small helmet light if I wanted to see what’s going on peripherally. Ohh, that was 3 questions, not one. You got a three-fer-oner! Great article. A few observations. Test ride before you buy. We bought out tandem used with only 10 miles on it because the couple decided it wasn’t for them. Mt. Airy Bicycles in MD allowed us to test ride a number of different tandems all afternoon. Have some patience because it can be a learning process. Tell you stoker when you are approaching bumps or are about to do something that may not be expected. Try touring. It’s great fun on a tandem. 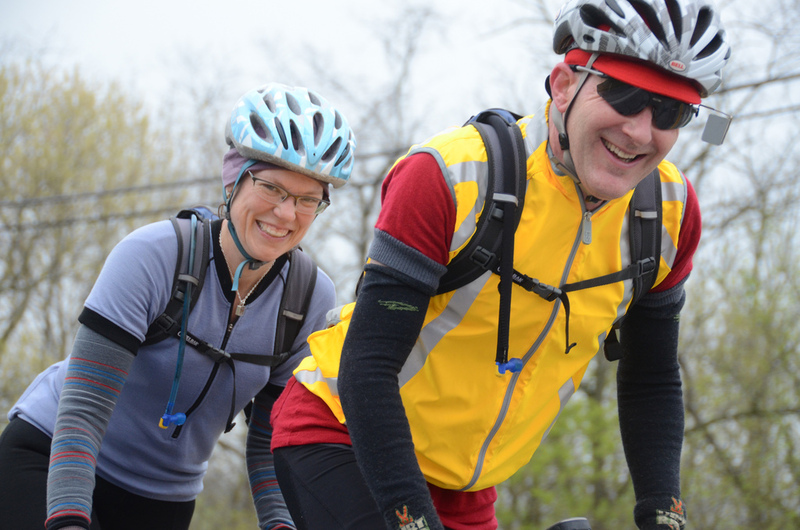 Do some rides with a tandem group or attend a tandem rally. You can learn a lot of useful information. Find a good mechanic who understands tandem. Enjoy the ride and don’t turn every ride into a hammerfest. It’s a great time to talk and enjoy the scenary together. Great points, Barry. Also, your comment about finding a mechanic who knows and understands how to work on tandems is such a good one. Until we found that, we dealt with all sorts of crazy issues, from shifting to wheels detensioning on us. Came across this by accident! Glad to see a fellow tandemer and blogger! Hope to hear back from you via our site. Loved the article, loved the comments. I’m a 40 year single(s) rider, 4th year tandem rider. ( My wife and I are both in our late 60’s). My wife never rode a single so the learning curve was both good, and less so. No worry with the changes in pedaling cadence, she didn’t have one. As she had no experience everything was new, especially the pain. Back, legs, neck, hands, you know. All that said, she has become a worthy stoker, and seems to genuinely enjoy her accomplishments to date and the experience as a whole. Still working on increasing both mileage and levels of difficulty. Great times for sure.